The episode ends with Don Draper meditating cross-legged on a California bluff above the ocean and chanting "om." The camera closes in on his face. He smiles. Cut to the Coke TV commercial that includes the song "I'd Like to Teach the World to Sing in Perfect Harmony." I first thought the ending meant that Don had found an inner peace and self-awareness that finally freed him from the problems of his previous life. I thought that ending the episode with the "buy the world a Coke" song was an ironic commentary on the fact that the world went on without Don, who actually had found the "perfect harmony" that some other less enlightened ad man back at McCann Erickson tried to commodify to sell soda. In other words, I thought that the mentions of Don giving up the chance to work on the Coke account by going AWOL from the ad agency, and the visual gag in the previous episode of Don being asked to work on a Coke machine, had been there to set up the fact that he actually managed to walk away from such an enticing temptation. Don was happy sitting in the grass chanting, while the crass commercial world went on without him. All that's wrong with that optimistic interpretation is that it apparently is absolutely wrong in every way. What's even stranger is that my reading of the ending was so sunny and positive (words not normally used to describe my attitude about anything), because I didn't even consider the more cynical version. My brother (who, in my partial defense, misinterpreted the ending the same way I did—maybe it's something in our genes) told me that members of the Internet hive-mind were speculating that the true meaning of the ending is that Don later went back to work and was the creator of the Coke ad. What both of us had interpreted as a beatific smile of genuine let-the-world-go bliss was seen by those theorizers as a crafty smirk. To them, it showed that Don was having an "a-ha" moment about how to monetize what he was feeling by using it to sell soda. That interpretation works better in every possible way as a capper to a series about the shamelessness of an industry in which (for example) cigarettes are just fine to sell until you lose the account, at which point saying how bad they are becomes a marketing tool. It also works as further proof that Don Draper just can't help landing on his feet no matter how far he falls. Like the protagonist of Hubert Selby Jr.'s novel "The Demon" (to use a very strange comparison), he can do no wrong even when he's doing wrong. When he goes in search of redemption, can't find it, loses everyone and hits rock bottom, that's where he manages to find the raw material for an idea that will put him right back on top again, with one of the most memorable ad campaigns in history. There's only one thing wrong with that ending, in fact. It happens to be executed terribly. That's because it's a conclusion that shouldn't have been left open to interpretation. This wasn't a Tony Soprano "did he die or not" situation. Leaving open even the possibility that someone could misinterpret the "Mad Men" finale is bad storytelling, plain and simple. What it needed was one last shot that we don't get: Don Draper back in a conference room as the Coke commercial reaches its end on a screen that clients are watching. Don smiles with satisfaction, knowing he has nailed the presentation of his life. Cut to black. The reason we need that shot is simple. The Coke commercial exists in our real world. We know that "Mad Men" isn't a documentary about the guy who created it. That's why it didn't even occur to me that the ad we see at the end of the "Mad Men" finale could be Don Draper's work. Think back to the classic Kodak Carousel slide projector episode. We had to be shown that Don came up with the name of the product, because there's no way we would assume so otherwise, because Don isn't real. Imagine if we had seen Don Draper intensely watching an Apollo launch during one of the 1960s episodes, and then the next shot was the video of Neil Armstrong saying his "one small step for man" line on the moon. Even if we didn't see a nametag on Armstrong, we still wouldn't assume the astronaut was Don Draper, no matter how hopeful and yearning he seemed to be in the previous shot. If we saw Don's face in the space helmet and saw him mouthing the line, though, at least it would work on an "okay, this must be an alternate reality in which Don drastically changed careers" level. 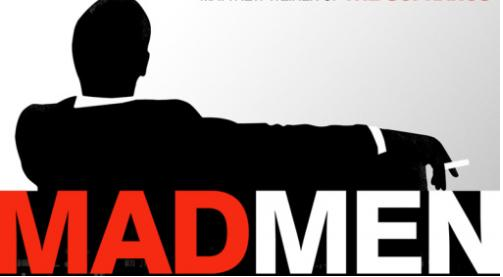 What's tragic (well, as tragic as anything involving something as trivial as a TV show can be) is that the "Mad Men" finale episode's greatness won't be apparent for some viewers without an explanation that shouldn't have been required.